WEST LAFAYETTE, Ind. — New York-based Aquila Theatre Company will present Henrik Ibsen’s gripping 1882 drama “An Enemy of the People” at 7:30p, Feb. 25 in Purdue University’s Loeb Playhouse in Stewart Center. When trusted physician Dr. Stockmann makes the shocking discovery that the town's celebrated and profitable spa is toxic, tensions flare. The doctor must defend his findings as he desperately tries to convince city hall of the life-threatening danger, placing his reputation, livelihood and family at great risk merely because he is the bearer of the bad news. The event, which is presented by Purdue Convocations, includes a pre-show discussion featuring a member of the cast who will talk about the conceptual and artistic motivations behind remounting Ibsen’s classic in contemporary America. The discussion begins at 6:30 p.m. Feb. 25 in Stewart Center, Room 311. With a plot that could have been ripped from today’s headlines, “An Enemy of the People” explores the impact of severe ecological issues on a small town and one man’s crusade to uncover the truth. When trusted physician Dr. Stockmann makes the shocking discovery that the town’s celebrated and profitable spa is toxic, tensions flare. The doctor must defend his findings as he desperately tries to convince city hall of the life-threatening danger, placing his reputation, livelihood and family at great risk merely because he is the bearer of the bad news. 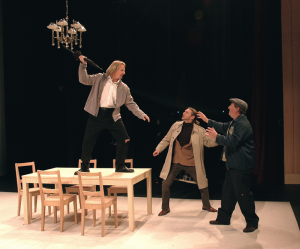 Originally set in a small town in Norway, but now placed in contemporary America, this classic is seen anew through the eyes of the Aquila Theatre Company, a troupe dedicated to the reinterpretation of classical drama. Tickets are $28 for adults and $20 for those 18 years and younger, Purdue students and Ivy Tech Lafayette students. Tickets are available at the Elliott Hall and Stewart Center box offices at 765-494-3933 or 800-914-SHOW. Tickets also are available through Ticketmaster outlets. Discounted tickets for groups of 10 or more can be ordered at 765-496-1977.